Buy it now at 30% off for $24.47 (normally $34.95). ﻿﻿﻿ One of the phrases heard a lot these days is “gardening for a purpose.” What that really means is gardening for a reason that goes beyond your own personal whims and preferences. It means looking at the choices you make in your garden and determining what effect they might in the larger environmental scheme: wildlife, fossil fuel and water consumption. It means, in short, mindful gardening with an eye beyond the fencepost. The word sustainable, I know, has been used to death, could almost mean anything . But think of it this way: “Applied to gardening, [sustainability] means using methods, technologies, and materials that don’t deplete natural resources or cause lasting harm to natural systems.” Now, that sounds pretty reasonable, doesn’t it? This definition comes from the introduction to The New American Landscape: Leading Voices on the Future of Sustainable Gardening , edited by Thomas Christopher. But, I would add a fuller definition: If done well, sustainability means improving the land and environment around you, making a lasting contribution on your own patch of ground help ensure a healthier landscape in the future. In this new volumn, 13 writers–including horticulturists, academics, botanists, nurserymen, and just plain gardeners like us— address issues ranging from invasive plants, water use in the garden, and climate change to green roofs, edible gardens, and the relationship between wildlife and native plants. It’s an impressive range of talent, and the subjects they write about affect gardeners everywhere. It’s tempting, maybe even natural, to think that what we do doesn’t have much impact in the face of global environmental threats. 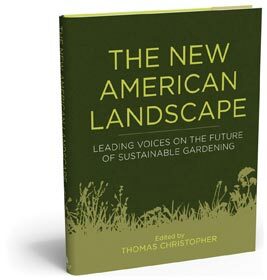 But as Tom Christopher said, “If you look at statistics … it soon becomes clear that gardeners have an essential role to play in the solution any of these crises, and that we can have a personal impact.” If you really want to make a difference, reading The New American Landscape would be a good place to start. Think about it and we’ll see you in the garden. P.S. We’re beginning to put in veggies and flowers we started from seed. We’ll get tomato starters in a week or so. I’m trying a herb garden in a patch not far from my kitchen door. The aphids are starting to appear, along with thge slugs. P.S.S. If you’re not familiar with Timber Press and the wonderful books they publish, visit online at http://www.timberpress.com/.